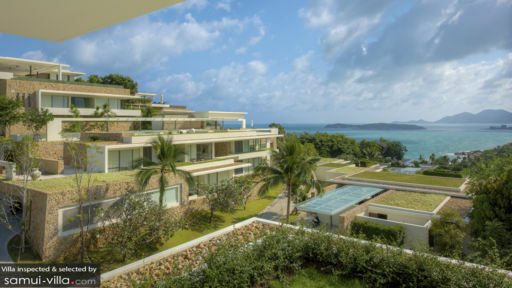 Villa Yee Sip Et is a four-storey vacation residence that epitomizes forward-looking architecture and minimalist design. Created, overall, by a combination of timber wood, glass and stone, spaces are furnished with elegantly crafted accouterments as well as equipped with five-star facilities – to ensure your complete ease and fun. 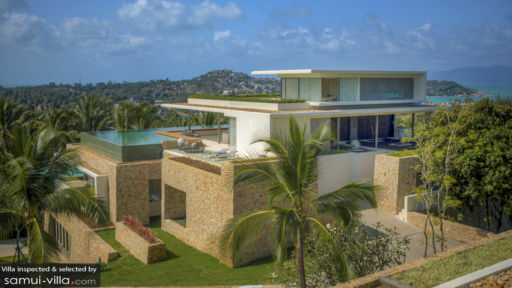 Atop a hill ascending from Choeng Mon Beach, Villa Yee Sip Et bestows exquisite vacation living with an appeal that’s certainly high-brow. One of the villa’s two master bedrooms is on the topmost floor. Another master bedroom is on the villa’s first lower ground floor along with four guest rooms. All six bedrooms have king-sized beds, exclusive bathrooms with rain showers and free-standing bathtubs as well as furnished balconies with breathtaking views. Along the corner of the villa’s ground floor exterior is the 18-meter, angled infinity pool where you can linger by its scenic edge and look out – spellbound – to the mountain range and the coastline. On the stone deck at one end of the infinity pool is a circular day bed where you can laze as you bathe in the sun. 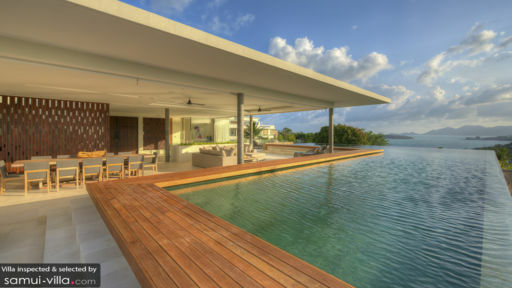 A few steps down from the swimming area is the sunken and semi-open common space where the living area, dining area, bar and modern kitchen are arranged. Enclosed in a room further inside the ground floor is a second living area. On the villa’s first lower ground floor is a cinema room with layered seating. The villa’s fully-equipped, private gym, game and spa rooms, study as well as second kitchen, bar and dining area – which can also serve as a conference room – are all on the second lower ground floor. With a manager at its helm, the villa’s amicable staff carries out daily services like airport transfers, daily breakfast, housekeeping, pool maintenance, gardening and security. The staff is also at your beck and call for tours, babysitting, personal catering, laundry and wellness treatments. These services aren’t included in your booking. A short distance from the villa is Choeng Mon Beach where there’s non-stop swimming, snorkeling and aqua sports. At low tide, you can even hike to nearby Koh Fan Noir. Allow yourself to binge at the Walking Street’s Night Market every Wednesday – filled with discounts that will delight you.